Vermibus came onto our radar a little over two years ago with some arresting ad busting imagery and the motivation to go big consistently. Initially I wasnt fond of the results because they weren't transformative enough. I still saw models and ad campaigns through the smeared inks. While the work was critical of the advertising content, it spoke nothing about public space and its use for a wide range of commercial messaging systems. This last component of ad takeover work is important to me and can be solved easily by simply denying the typical ad imagery a place in public space and re-appropriating that space for some non sequitur. By leaving the ad content in the final image, Vermibus' work didn't alleviate the commercial burden and therefor didn't free my mind to ponder other significant uses of public space. I was wrong. 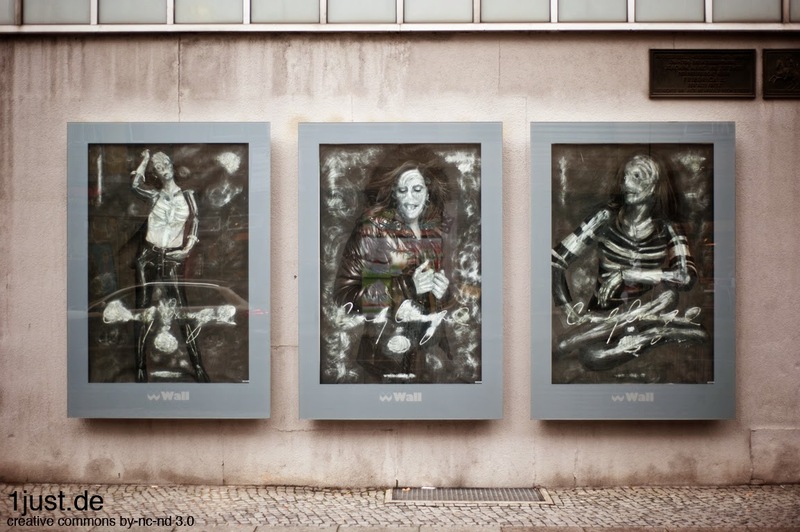 Not only does Vermibus exhibit the wide variety of keys and tools he has made with which to access public advertising venues, but his campaigns are so large that the individual image is subsumed by the larger project. Both of these aspects of Vermibus' process adress the public space issues that I have come to expect in good ad takeover artists' work. The first aspect I think is obvious, but the second demands a bit of an explanation. When I first started doing ad takeovers while I was attending RISD, one of the main dilemas I faced was that of authorship. How could I justify removing advertising if I was simply replacing it with advertisements of my own? This meant not only could I not sign my work, but that I became afraid to settle into one type of imagery for fear that a recognizable style would be as bad, or worse than simply signing my work. It was important to me that people see my ad takeovers not as a personal demand for more of my own space, but as an anonymous demand for space in general. And so it was decided that I would slowly seed the world with hidden gems that would be discovered, pondered, and then left to alter history in the smallest of ways, a weak gravity between two asteroids whose paths will change a distant planets history billions of years in the future. Since then I have found that while this quaint personal activism has its merit, it has its obvious downsides, a slow march towards progress if ever there was one. Mobstr made it clear for me two years ago in Stavanger at the NuArt festival, repetition and recognition had thier benefits. Stavanger is a small town and I was able to blanket the entire downtown area with only 32 takeovers. Acting over the course of two hours one night, there wasn't an advertisement left in downtown when Mobstr returned from his painting work elsewhere in the city. He explained that the continuous repetition of my imagery as he entered downtown, made him think about the shear number of ads and the burden with which they weigh on public space. For me this was a concrete reason for the imagery to be recognizable, at least within a single project. 1-When and why did you start doing advertising takeover work? 1) I’ve been actively painting in the world of graffiti since 1998 but there was a time when my life changed and had taken a more personal way and at the same time with more social awareness. It was when I moved to Berlin in 2011 when I started taking things seriously about the public space. My anti-advertising work started almost right after I arrived to Berlin but I needed around a year to understand what I was doing. I think that being an ad buster is not only putting something on advertising spaces, but an internal change process in all senses. 2-Your work seems to both eliminate advertising, while simultaneously referencing the fashion iconography that is so prevalent in todays advertising imagery. Can you explain to PublicAdCampaign readers why you only work with fashion advertising outdoors? 2) There are lots of people who have been talking for a long time about brands and their lack of ethics regarding their workers or a certain number of internal policies and the truth is that there are more people who can talk about this better than me. I come from the picture world and have always been very interested in the world of advertising iconography. In my last job as a photographer I had some bad experiences regarding what the beauty standards should be like and I took advantage of that situation to make a public reflection of what has affected me personally. On the other hand, after some time working just about fashion advertising I figured out advertising should be more aggressive but without being loutish, because the message is lost when there’s a destruction. The best way to do anti-advertising is just taking the ad away and not putting anything. That’s how the NO-AD project was born. By chance my first intervention on advertising was leaving it blank when I took the poster to work later on it, therefore NO-AD has always been pretty linked to my job. Now I follow both lines. 3-You exhibit the tools you use to break into outdoor advertising locations when you show your work, which leads me to believe that promoting access to public media space is part of your critique. Can you tell us your thoughts on the relationship between outdoor advertising and public space? 3) As a graffiti writer I’m very attached to materials auto-production. A lot of us have done our own kind of markers or inks and I always saw it something very personal and nice to show, but in the world of graffiti there’s a lot of secrecy and it isn’t normal someone tells you how he makes the acid or which inks he has combined to get a certain colour or composition. I don’t mind showing my keys because I think it is a very personal part of my job and it’s nice to show them. I don’t have any kind of secrecy at the time of explaining how they are made, but the truth is I’m extremely careful of to whom I give that info because not all of them will use it for anti-advertising purposes. I don’t believe everyone is aware of what opening this shelter takes, what should be done or not and overall, I think you must have tried it by yourself before ordering the keys online as if you browse in Google. Whoever really wants to intervene advertising must make an effort trying it himself, otherwise he will not worth it in the same way as if he had been looking for his own way to do the key. Although I appreciate there are people like you who make keys at home because the less advertising there is, the better. One way or another that’s the final goal. 4-I noticed some of your gallery work is similar in process to your outdoor work, but uses fashion magazine advertising or photography. What is the relationship between your indoor and outdoor work? 4) There’s no aesthetic difference, the process is more less the same on books, magazines or advertising. The difference is the used space. When I exhibit in a gallery I want people to focus on the plastic and emotional part of my paintings and not only on the fact that I intervene advertising on the streets. When I work on the streets I want people to focus on the activist part of my job and to think about throughout my art. More often than not I exhibit posters on the streets and put them in a gallery. That’s not strictly ad busting but it has something to see with anti-advertising because if there’s a poster hanged on a gallery means that there’s an empty advertising space on the streets. 5-What is your favorite story from your ad busting adventures? 5) Making “Dissolving Europe” travelling was a great and intense experience in all senses and it is difficult to beat all the adventures we lived in those 18 days doing interventions every day. Bu there are also some other emotive moments such as conversations with people about what they think about the interventions, normally people completely unrelated with this movement…It is incredible all what they have to say, I have learnt a lot in all conversations I had. All those people have made me think about everything and grow both as an artist and as a person.